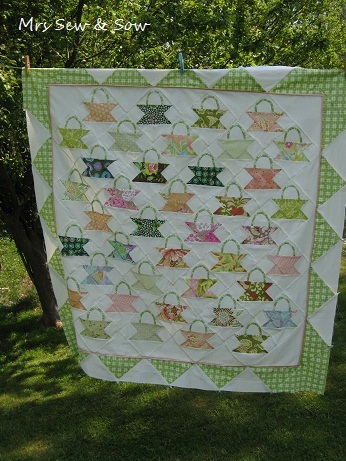 My eldest is waiting for a Christmas Quilt! At first she didn't want one but then I started this quilt at a class with Gwen Jones (in 2009, I think) at my LQS and she has asked for it to be hers. It is all hand pieced so I think it is remarkable that I have come so far with this one. The irregular octagons are blue and the stars are all scraps in purples, light blues and light yellow. Backlit it reminds me of stained glass windows! 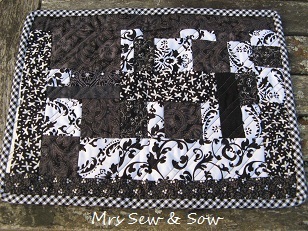 I have bought the backing fabric and have pieced it together. 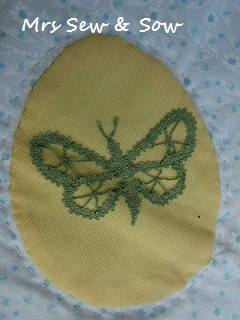 It has stars (appropriate I thought) and butterflies on it and was on sale - Flutterby Garden by the Buggy Barn. She approved! Now before she nags reminds me too many more times I had better get on with it! My yougest AKA the Tudor Princess has already celebrated the Wedding! Everyone went to school in red, white and blue! I even joined in that bit! 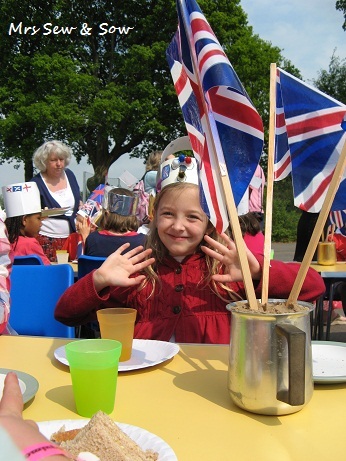 Then there was a bit of a street party in the afternoon for the whole school together in the playground, with sandwiches and cakes and party hats which the children made the day before. There was also a quiz going on in the hall as the teachers (all female - I hasten to add) had brought in their wedding dresses and we had to guess which dress went with which teacher. I only got three out of ten right so I do not know them very well do I? This is how we celebrated - what are you doing? Wave back please - she's watching! 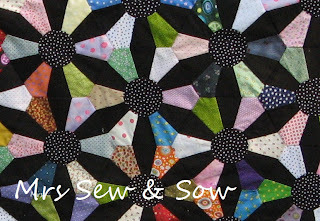 Kaleidoscope Hexagon quilt is moving on! 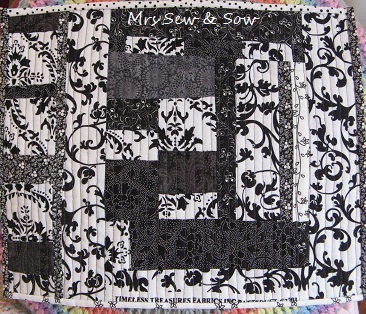 I have added my tumbler borders onto this quilt. It has taken quite a time as I suddenly decided it would be best if I could use the kite shapes to go round the corners in some way. Needless to say it took me more than a few moments to work out how to do this. 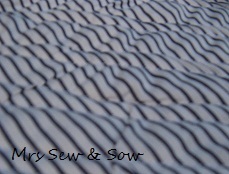 And even then the good ol' seam ripper was needed quite a few times before it gave in and decided to lie down!!!! Quite a struggle that one - I think I should leave some of my 'brilliant ideas' alone. 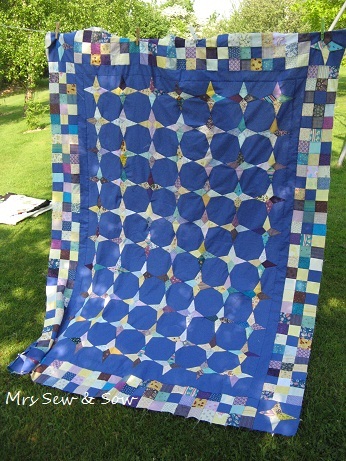 So here is the quilt with the tumbler border - all pieced and ready for layering and beastly basting. Is this a tada moment - oh yes I think so! 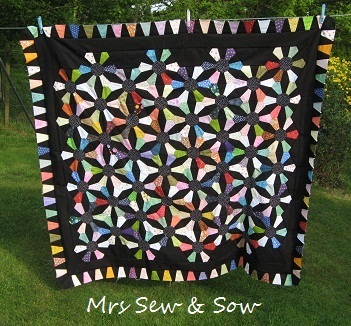 I am particularly pleased with this top as it is all hand pieced apart from stitching the tumbler border on - even the tumbler border itself is stitched by hand. 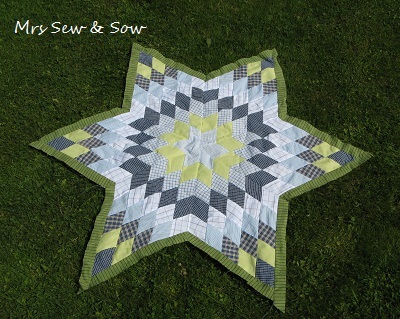 Secondly when I started making this I didn't really like it so I even started other blocks, which I will make into another quilt perhaps, but I persevered out of shere doggedness and now I love it!! I can be quite thrawn (Scottish word meaning stubborn) when I want to be! Is it too early to get ready for Hallowe'en? Since I missed the deadline for my Christmas wreath and Hallowe'en banner I thought I'd get in early. Here is a little bundle of flags - quite cute I think! 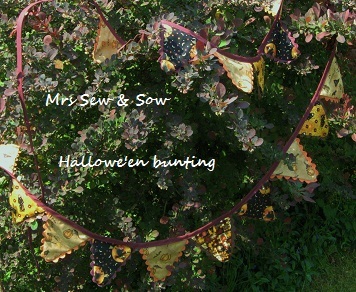 Here is my idea of a Hallowe'en tree bush! It's purple, it's prickly, it's Berberis! 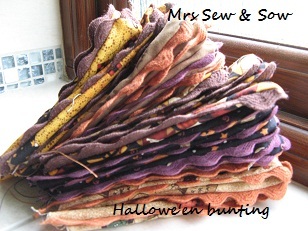 And here is my bunting resting, waiting for someone to string them up! What are you making well ahead of time? Go on tell me - I won't tell anyone else, it'll be our secret! Shhhhhh! I did straight vertical lines last time, so this is straight double diagonal lines - bit wonky in places but I think that's because my presser foot was sticking to my too sticky masking tape, also didn't have my glasses on! Silly me! Okay I messed up, but these are only practice pieces and I have to admit I need more practice! That is the point! Onwards and upwards (hopefully) - this is a warts and all post....! Yes I know another UFO! 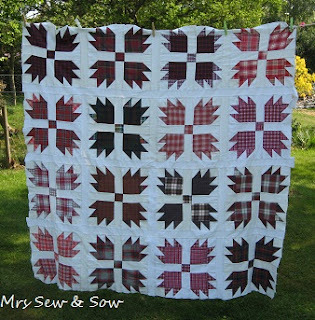 I love the Bear's Paw block and when I saw the Worn and Washed collection of recylced red flannels I knew the two belonged together. 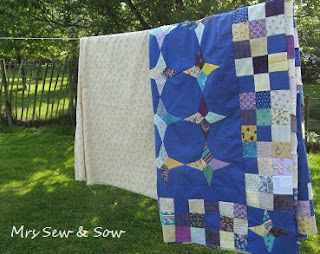 As the flannels were recylced I wanted a recycled background so I cut up some old flannel cot sheets we've used over the years and this is the result. Don't know how long it will survive but this is it's second life! My mother was a keen floral artist and because of this she knew the value of leaves of different shape, size, texture and colour. 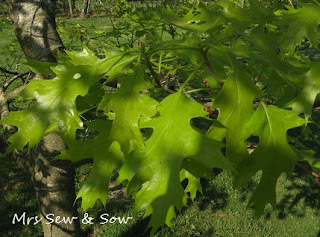 So I have always loved leaves in my garden - the colour may generally be green but there are shiny leaves, matt leaves, ribbed leaves, hairy leaves and many more shapes, sizes and colours. 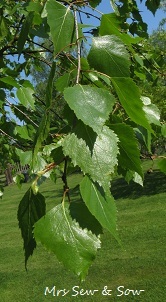 What's more leaves last all season whereas the flowers are there for but a short time. I find the colours of leaves restful and cool. New leaves are coming out all over and what better than the delicate shades and textures of the new leaves in Spring with the dancing shadows playing on them! I have been busy working on my little basket quilt recently. 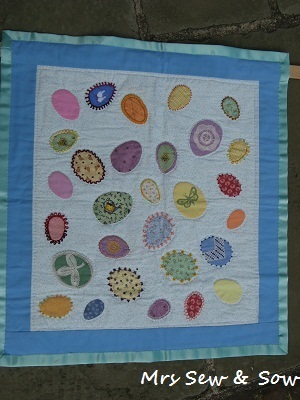 The blocks are all sewn together. I have added a 1" folded strip in peach round the edge - is that called a filet? Cannot remember, but someone will know??? If you do please tell me! 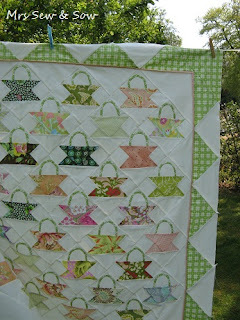 Then a dogtooth border comes next in the same green check I used for all the basket handles. That may not have been a good choice as I had to match up the seams on the border to those on the quilt. It took several goes to get an acceptable result - still not perfect, so something I'll need to work on in the future! I was wanting a fresh spring look and the fabrics do give it that - so thanks mainly to Kaffe Fassett but there are some others in there too. Now I just have to do get the back of the quilt sorted - I'm piecing it with leftover blocks and fabric. 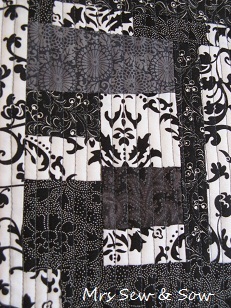 Then the layering and beastly basting - although this is a smaller quilt and consequently easier job! 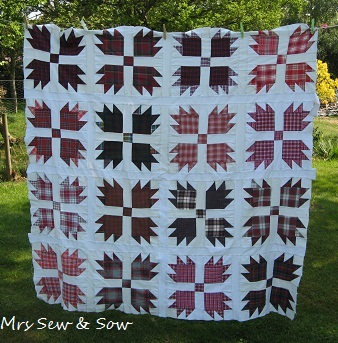 I am not sure yet how to quilt it except in the ditch - I shall have to ponder on that one! What are you expecting from this post? 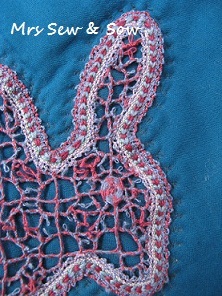 I made this little rabbit from lace - it is in the Russian style and is a tape lace to define the outline with a filling of plaits, picots and circles. 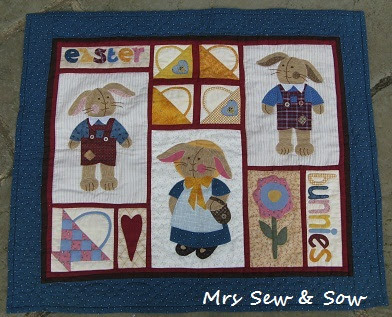 The pattern came from a Dutch book Motieven in kleur by Sebastiana van den Henrik. It is the only thing I have done from this book as yet. 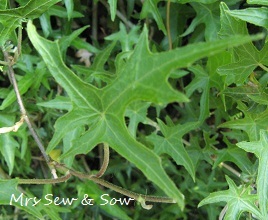 It is quite repetetive to make and allows little room for adaptation. I mounted it on a contrasting fabric to show off the lace and then did some outline quilting round the rabbit and big stitch quilting round the edge interspersed with some bright beads, the a contrasting border and finally a velvet binding! Still really like this piece, although I was a bit fed up with making all those picots by the end - but that's traditional Russian style apparently! Do svidanya! or Until we meet again in Russian! 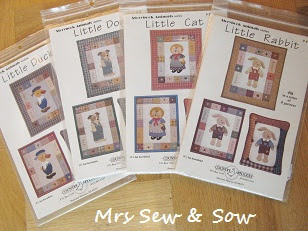 Over on fab designer Kate Spain's blog The Drawing Board she has posted about her new line of fabric (worth seeing! drool) but also about her recycling habits to celebrate Happy Earth Day. Well here is one of my recycling tips. It's amazing what you can store in one box! 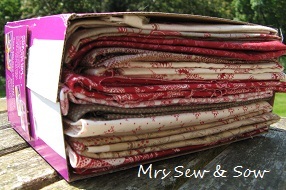 12 lovely red/cream fat quarters in the second photo - and some may actually be 1/2 m - all sitting together ready to inspire me, visible but not in a heap! With different covers on I can more readily remember where I stored something as I always have more than one project on the go! Don't you??? 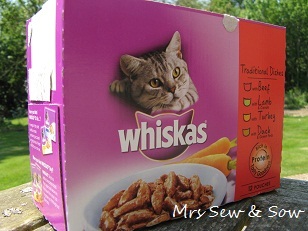 Go out and buy Whiskas pouches for your cats - only the 24 Bumper Packs will do but you do get two! Wonder if they will send me some free cat food for this bit of advertising!??? No, I thought not...to be honest, I'd rather they sent me some fabric, and Kate Spain's Terrain would be a good start! If you cannot get these boxes or for some bizarre reason do not have a cat (lol) start looking in your supermarket for products you do want with the right shape of box! Go recycle but first leave me a comment about your top tip! I was feeling too hot to sleep - how mad is that in April in England? Anyway I started playing with fabric scraps on my sewing room floor at 2am and came up with this. 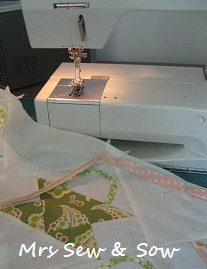 In the morning I went to the sewing machine and not sleeping suddenly got better...not sure what it is but it was fun doing it! 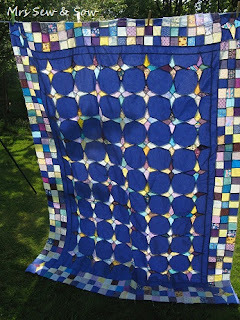 I used it to practice some machine quilting as I have not done much of that and if I am ever to fininsh off my UFOs I will need to improve...! First practice - straight lines. 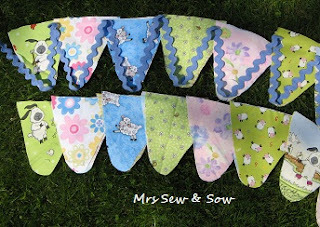 Methinks a few of these little monochromes are about to be made... and I could practise different quilting designs in each - what another project? What do you do when restless at 2am? - clean answers only please - I am British!! 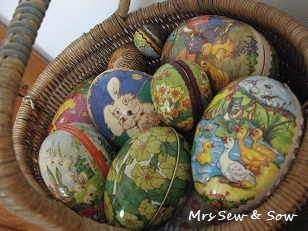 Papier mache egg containers are used in Germany to hide a little treasure for a little child. I got one of these when I was young and it has been used over and over again through my childhood. Bit of a grumpy looking Easter Bunny but so would you be if someone stole your eggs! The collector in me decided to seek out some more from Ebay and the Ardingly Antiques market. I particularly like the old ones. These sit in a basket, with some more modern tin eggs, as decoration during the Easter season - I don't use them to hold something as our Easter eggs are hidden outside in the garden, if the weather co-operates. 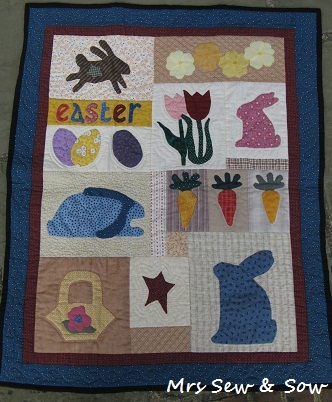 And a big Easter bunny gives clues as to where the next set of eggs wil be found. And if I am nimble enough I will get some action shots as some not so small children run around the garden :D - well it's a bit of exercise to combat all those naughty calories! Me included...! Have fun chasing down those Easter eggs! This is another UFO project that has ground to a halt. I made the star and then didn't know whether to applique it onto a backing fabric or piece in the background sections. And that's where I stopped. As this fabric is recycled apart from the green stripe and lime green I have now decided it will be best to applique it onto a background. I will move on with this project. 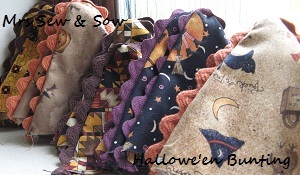 I will also make some satellite stars to surround it in the same fabrics. Little blocks - that will be fun! 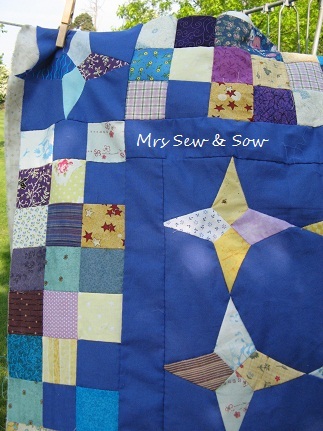 The fabric came from charity or goodwill shops, especially Oxfam! 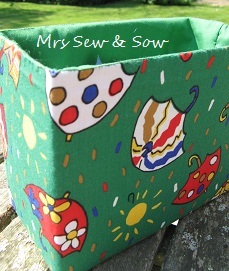 Do you work with new or recycled fabric? Do you mix them up? 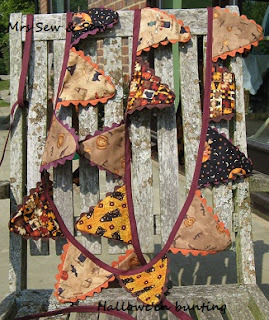 Do you like bunting? I do and last year I went a bit mad for it with some cute Easter themed fabrics and colours and some gorgeous large ric-rac braid. 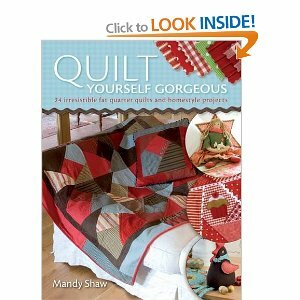 The original inspiration came from this book Quilt Yourself Gorgeous by Mandy Shaw which you can get here! one step beyond. Cue Madness.....song, not mental strife! 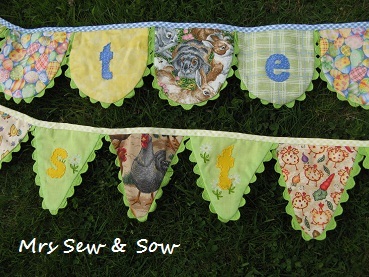 Can you see the green fabric with daisies on underneath the letters T and S? That is a little piece left over that my mother kept from a dress she made me when I was in my early teens to go to my cousins wedding - well he is due to retire soon....doesn't time fly?? Okay enough embarrassing stories! And last year I wanted to make Russian matroyshka bunting, for Christmas of course ...here is the fabric. Have you got any of these - they certainly seemed popular at the time? That makes least three sets of bunting - my UFO list lengthens as we speak! 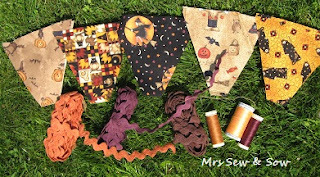 How is the bunting in your life? Are you all s-t-r-u-n-g out or floating on the breeze? 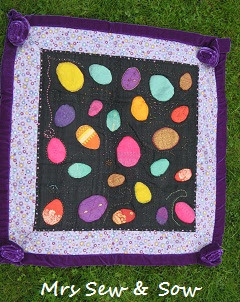 Who doesn't like Easter Eggs! These wall hangings are entirely my own design. 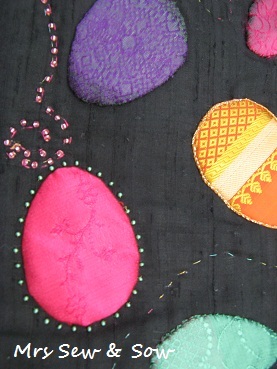 I was inspired by Faberge and his Imperial Easter eggs to make this version in silk. 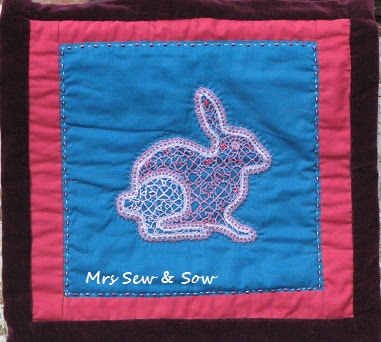 I bought the silk at the Ardingly Quilt Fair one year from a company that imports silk saris - sorry cannot remember the name. The problem with these fabrics was that they shredded very easily which made the hand applique quite tricky - I ended up using Bondaweb on some. Then to increase the opulence I added a velvet border which I embellished by making the flowers in the corner. The second one was an attempt to use up lots of bits of lace which I was making at the time. I was worried they would get lost or rumpled up so I decorated some eggs with them. 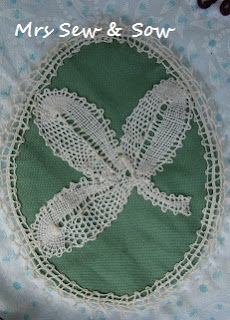 They are sample pieces so lots of different types of lace including Bruges, Brussels and Torchon lace. At least they are safe and now get a showing every Easter rather than remaining scrunched up in a drawer somewhere. Even though these are tiny pieces of lace they represent some hours of work - one of the reasons I no longer make lace but I have invested in it too much to give it up altogether. I am now patching with some of my lace friends so I might slide back into it with their help but as large pieces of lace is slowwwwww going you have to take delight in the mini-world! You can connect to the UK Lace Guild here! 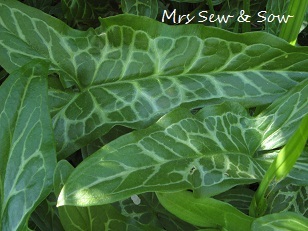 and you will find a list of US Lace Guilds here! and the Australian Lace Guild is here! Even if you do not take up this craft you may enjoy looking..? Enjoy lace! Leave a comment if you want to know more...and I will get back to you. 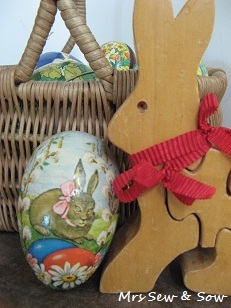 Is it time to get out those Easter decorations yet? - a few of you already have so I am not the first. 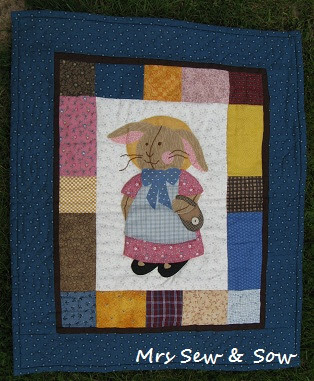 The little girl rabbit was actually a cat in the original - which I adapted to have a bunny face as they were to be Easter decorations. 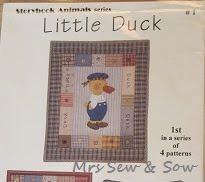 The others in the series are a duck and a dog. You could do them all and make a quilt or make cushion covers or wall hangings. 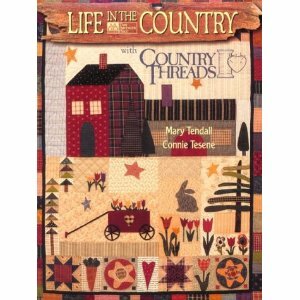 I think I got them from my LQS and they are from the Storybook Animals series by Jan Kornfeind of Country Appliques. 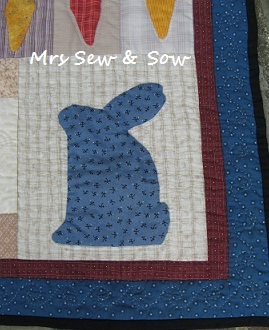 Maybe I could do the duck for Easter too...! He is quite cute with his sailor hat on! 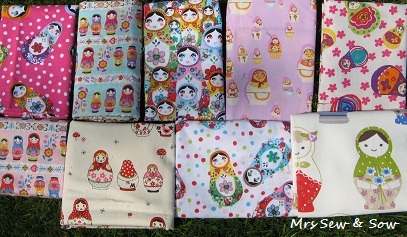 Do you have any of these little treasures too? These are some of the first little hangings I made - only the Debbie Mumm hangings pre-date these...but that's a Christmas story..
Is the Easter Bunny in your neighbourhood? Tell me where to find your blog posts about your Easter decorations! Or just say hello, I'd like to get to know you! 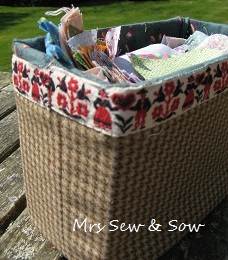 Here is one I finished earlier! Crochet cuteness on the beach! 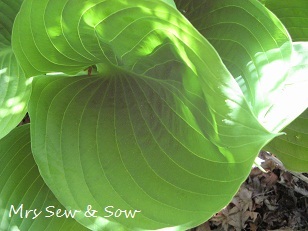 What's new in the garden ....? It must be Spring! Look! Don't you think Giveaways are dangerous? Was I naughty this weekend? Things have moved on in the garden! The V & A is calling me...!